Mountain Sorrel (O. digyna) is the only species of Oxyria recorded in Britain. It is a native species. Three British miners are recorded on Oxyria. A key to the European miners recorded on Oxyria is provided in Bladmineerders van Europa. On Fallopia, Persicaria, Polygonum, Rumex and ? Begonia, but not yet on Oxyria, in Britain. On Begonia [Begoniaceae] and other genera of Polygonaceae elsewhere. Widespread in Britain. Also recorded in the Republic of Ireland. Widespread in continental Europe. Also recorded in Morocco, Algeria, Tunisia, Syria, Israel, Korea, China and Japan. Pegomya bicolor (Wiedemann, 1817) [Diptera: Anthomyiidae]. 1b > Leaf-miner: Linear mine, becoming a blotch. Two or more larvae feeding together. Frass in lines. 1c > Leaf-miner: Initially a gallery is formed, this turning into a blotch, and later two successive conical leaf-rolls (UKMoths). Initially a pale, later brown, usually lower-surface blotch. The blotch is preceded by an epidermal corridor, but that may be obliterated by the later blotch. Silk at the inside of the mine causes it to buckle up a bit and fold. The reddish brown frass is accumulated in a corner of the mine. 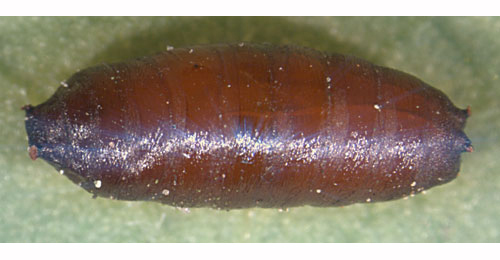 The older larva leaves the mine and continues feeding inside an untidy cone, made by cutting off a strip of leaf tissue and stitching it in place with silk (Bladmineerders van Europa). On Fallopia, Lysimachia, Persicaria, Polygonum and Rumex, but not yet on Oxyria, in Britain and Chenopodium, Lysimachia, Lythrum, Persicaria, Oxyria, Persicaria, Polygonum and Rumex elsewhere. Occurring locally in England, Scotland and parts of Ireland. Widespread in continental Europe.